Docker is an open source project to make developers and sysadmin easier to create, deploy and run distributed application inside a docker container. Docker is an operating-system-level virtualization, you can create system isolation for your application with docker for the application that is running inside the container. You can create hundreds of docker containers inside your server, the number depends on your machine hardware. 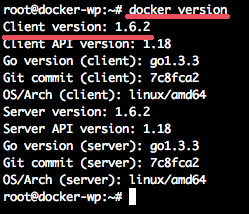 In this step, we will update the Ubuntu repository and then install the latest version of docker.io. In this step, we will download a new MariaDB images from the docker registry and create a new container based on that image. We will configure a new database and user for the WordPress installation. Next, create a new container from the MariaDB image for the WordPress installation. Before creating the new container, create a new directory for the WordPress data, database directory, and the WordPress code directory. MYSQL_ROOT_PASSWORD = configure the password for the MySQL root user. MYSQL_USER = create a new MySQL user 'wpuser' for the WordPress database. MYSQL_PASSWORD = set the password '[email protected]' for the user 'wpuser'. MYSQL_DATABASE = create a new database for the wordpress installation with name 'wordpress_db'. -v /root/wordpress/database:/varlib/mysql = linked database directory to the mysql directory '/var/lib/mysql' on the container to ensure data persistance. TheMariaDBriadb container has been created, now check the new user and the database for the WordPress installation to ensure there is no error with command on top. The new Docker container, MySQL user, and the MySQL database for WordPress have been successfully created. When the download has finished, create a new container from the images with the name 'wpcontainer'. You can get the result as below, or you can check that the new container named 'wpcontainer' has been created. WORDPRESS_DB_USER = define database user 'wpuser' for the wordpress db. WORDPRESS_DB_PASSWORD = password '[email protected]' for the database user 'wpuser'. WORDPRESS_DB_NAME = name of the database 'wordpress_db' created on step 2. -p 8081:80 = mapping the port 80 on the container to port 8081 on the host. -v /root/wordpress/html:/var/www/html = Linking the web root directory '/var/www/html' on the container to the local host directory 'wordpress/html'. 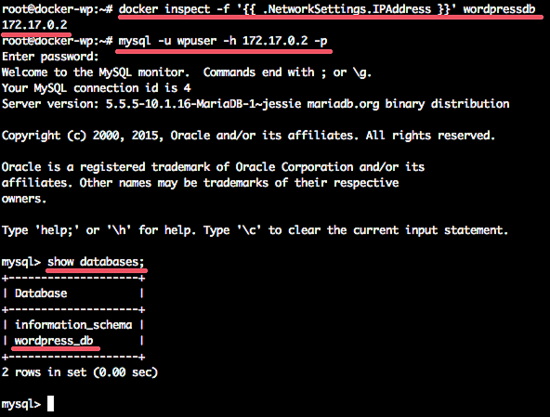 --link wordpressdb:mysql = linking the mariadb container 'wordpressdb' to the new continer wordpress 'wpcontainer'. 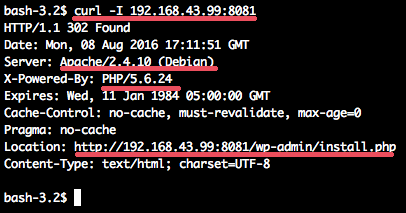 To see the WordPress container running, you can check it with the curl command on the host IP and port 8081. The web server is Apache, running on the Debian. PHP 5.6 is running in the container. You see the redirect to the WordPresss installation. In this step, we will install the Nginx web server on the host system. We will configure Nginx as a reverse proxy for the Docker container 'wpcontainer' on the port 8081. Next, go to the Nginx directory and create a new virtual host configuration for the WordPress container. Now, activate the new WordPress virtual host and delete the default virtual host configuration. Open your web browser and visit the domain name on the nginx configuration 'www.wordpress-docker.co' and you will be redirected to the WordPress installation. 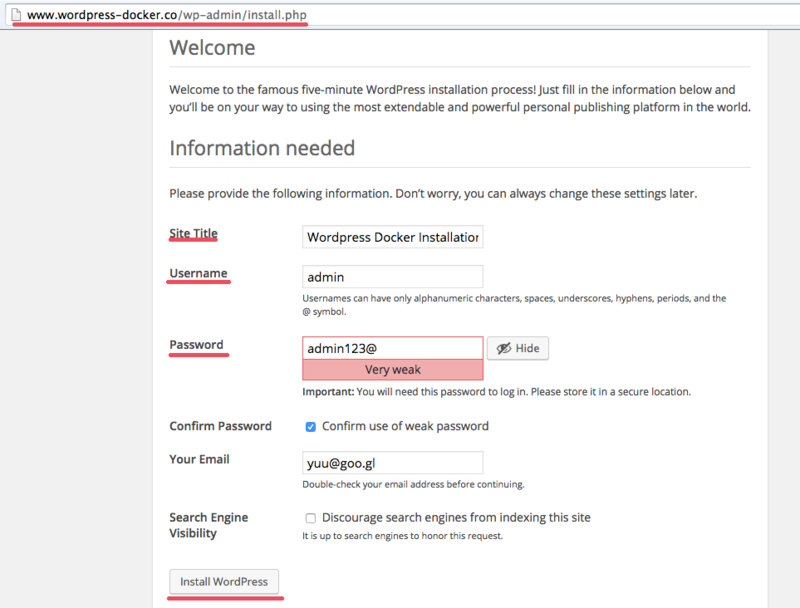 Type in your site title, admin username, and password, then click Install WordPress. 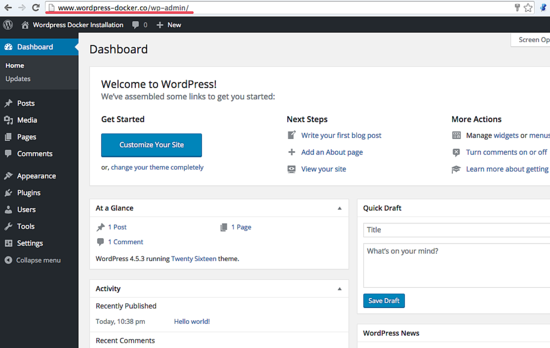 Now click on 'Login Wordpress' and fill in the username and password that you have chosen above, you will see the WordPress dashboard. The WordPress installation with a MariaDB container and a WordPress container has been successful. Have you implemented SSL yet? You'll want to add to isntall the mariadb-client-core package on the host otherwise you wont be able to test the SQL container. After installing the MariaDB client I was then able to run the 'mysql' command to login to the MariaDB. 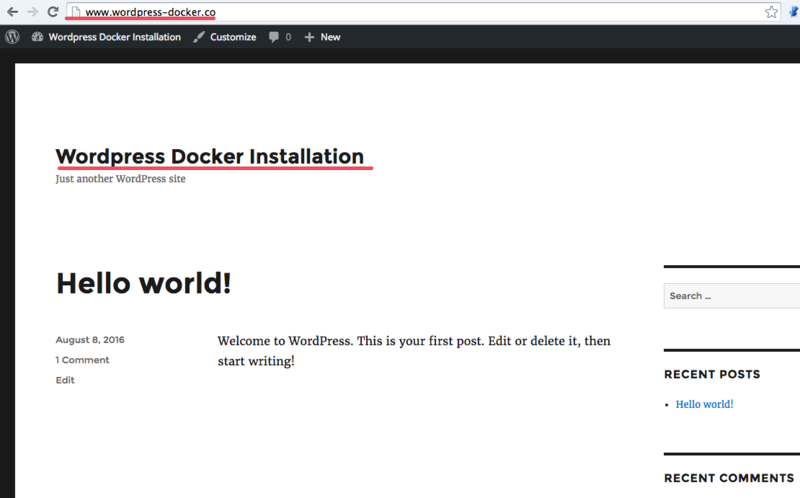 That being said, this is the best tutorial I have seen for getting Wordpress up and running on Docker. Can I ask why you don't install NGINX via docker as well? Hi, how to run it on my localhost? This means that you use a wrong password. Ensure that you enter the exact password that you have chosen for the MySQL user 'wpuser'.